Director Shankar has made an indelible mark for himself with his movies which are set on a huge scale and manage to stir the audiences thanks to the socially relevant content on offer. His movies such as Indian, Mudhalvan, Gentleman, Anniyan, Enthiran and Sivaji fall under this category and most of these movies garner all the attention whenever they are telecast on television, even today. Recently, when Mudhalvan was re-telecast for the umpteenth time on a leading private television channel, cinematographer K.V.Anand turned nostalgic and shared some really interesting anecdotes about his Mudhalvan working experience. "Watching Mudhalvan in Sun Tv. Nostalgic. Mudhalvan shooting was more like going 2 war everyday. Shooting in Mount Road,On top of a bus,Lots of blast, Crowd ... Shankar's hardwork ... Hats off to Assist Dir & My assistants. What a team! Rahman, Sujatha Sir, Vt Vijayan, Thotta, Kanal Kannan ... Perfect thought provoking commercial film"
Anand also detailed how they shot for the elaborately beautiful Azhagana Rakshasi number, the breathtaking Mudhalvane number and the peppy Shakalaka Baby song. 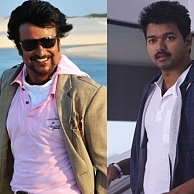 Endorsing a by-now well-known development, Anand mentions that Rajini and Vijay couldn't take up Mudhalvan for unknown reasons. Arjun then took it up and did a splendid job as we have all seen by now. People looking for online information on Ilayathalapathy Vijay, K V Anand, Mudhalvan, Shankar, Superstar Rajini will find this news story useful.